Today we were blessed to hear a wonderful presentation from Judy and Ed Lundin from the Community First! Village in Austin. 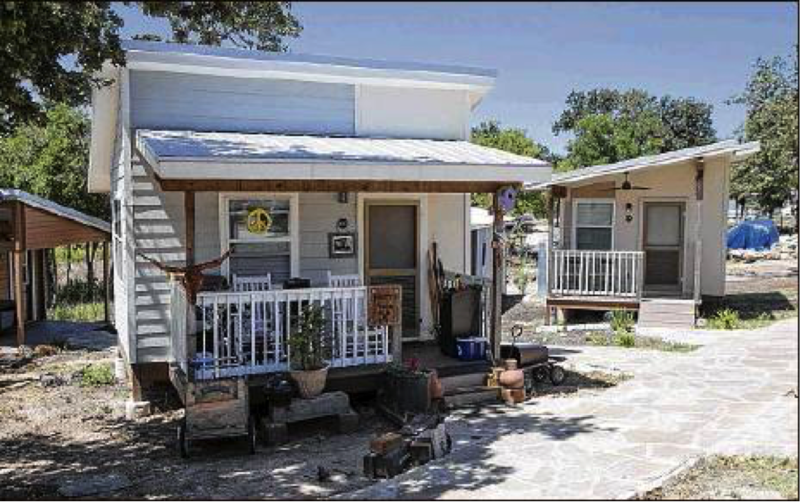 The Community First Village, in Austin, Texas has 120 micro-homes, 100 RVs and 20 canvas-sided cottages as permanent housing options. Mobile Loaves & Fishes began when five parishioners of St. John Neumann Catholic Church in Austin, Texas boldly answered God’s call to “love your neighbor as yourself.” Alan Graham and his friends began delivering meals out of the back of a minivan to men and women they found living on the streets. Graham readily admits that the group’s original approach for serving the homeless had some flaws, but with the help of a formerly homeless man they perfected the model that Mobile Loaves & Fishes successfully uses today. Their first trip serving meals on the streets of Austin was in September of 1998. Within a few months Graham and his group purchased a pickup truck with a catering bed. Since that first truck run, Mobile Loaves & Fishes volunteers have served more than 5 million meals with a side of hope to homeless men and women living on the streets. Delivering more than a sandwich, Mobile Loaves & Fishes volunteers hit the streets 7 nights a week, 365 days a year to provide food, clothing, hygiene products and other life-sustaining items to our homeless neighbors who are struggling to survive. With the support of more than 19,000 volunteers, Mobile Loaves & Fishes is the largest prepared feeding program to the homeless in Austin, Texas and has spawned similar food truck programs in other cities across the country. But Community First! Village is about more than just food. Their name indicates the difference. Their development represents a growing understanding that for the chronically homeless much more is needed. Food is of course an immediate need. And a safe place to live is critical. But Community First! Village includes the further understanding that to break the cycle of homelessness an additional ingredient is a feeling of community and family. 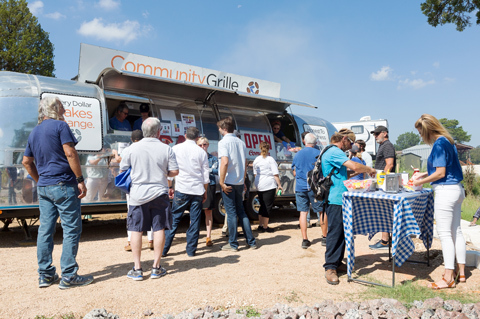 The Village, operated by the non-pro›it Mobile Loaves & Fishes has recently received a $2 million grant from the Downtown Austin Alliance that will go toward expanding the Community First Village and housing an additional 400 homeless people. The grant represents the Downtown Alliance’s largest gift ever and the largest that Mobile Loaves & Fishes, which serves the area’s homeless population, has received. “This generous gift from the Downtown Austin Alliance is part of the largest collaborative effort in Austin focused on mitigating the most intractable problem our city faces — which is our neighbors who find themselves chronically homeless and living on the streets,” said Mobile Loaves & Fishes founder Alan Graham. The money is the first push in an ambitious $20 million project to develop more land for homes, Graham said. The Community First Village is a 27-acre property that houses 140 people who were previously homeless. Construction is currently underway to build housing for 130 additional people by the end of the year, Graham said. The Downtown Alliance grant will go toward developing an adjacent 24-acre property the organization owns, where 400 more people will be housed, he added. The village is about 9 miles west of downtown Austin and has 120 micro-homes, 100 RVs and 20 canvas-sided cottages as permanent housing options. The homes are arranged in a neighborhood format to cultivate a sense of community, said Thomas Aitchison, communications director for Mobile Loaves & Fishes. “All people want are two things: to be loved and to be known, and that comes through community,” Aitchison said. Health services are available to community members through Integral Care, CommUnityCare, Central Health and Alcoholics Anonymous, among others. Bible studies, an art house, a community garden and a blacksmithing shop are also available to those living in and outside the community. The village broke ground in late 2014 and residents started moving in December 2015, Graham said. All funding for the community has come through private donations, he said. Though the village is nowhere near downtown Austin, it still ›its into the Downtown Austin Alliance’s commitment to help end homelessness in the city, said Downtown Alliance president and CEO Dewitt Peart. Peart said the alliance — a coalition of property owners, individuals, and businesses in the downtown area — saw the sponsorship as a strategic move to help solve the permanent housing issue for the homeless in the city. On July 16, 2017 Mayor Steve Adler announced a plan that would help address homelessness in Austin through increasing the hotel tax to provide services and establish permanent affordable housing in the city. The village, Graham said, would be an extension of Adler’s plan, as the Downtown Alliance’s grant money will help provide additional services, such as creating a marketplace for those living in the community to sell things they have made or contracting jobs to community members to help keep the village clean. 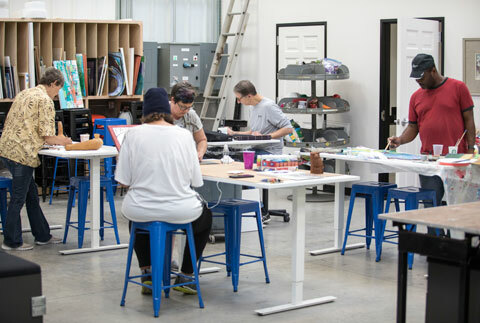 Community Works provides micro-enterprise opportunities that enable men and women who are coming out of chronic homelessness to use their God-given talents to earn a dignified income. In addition, the program empowers Mobile Loaves & Fishes volunteers to serve alongside and build enduring relationships with our friends as they develop new skills. 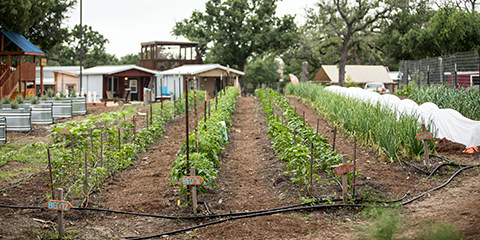 Through Genesis Gardens, neighbors from all over Austin come together to roll up their sleeves and engage with Community First! residents, practice hospitality, recall what it means to put down roots, and share the abundance of our yields. The bounty from the garden is washed, bunched, canned, pickled, preserved or cooked and provided to neighbors throughout the Village — giving them direct access to the best vegetables on Earth! More than 3 acres of organic vegetable production. Dairy goats, chickens, rabbits, donkeys, and honeybees! The Community Art House provides a means through which our highly creative artists at Community First! produce and sell some of the best works of art in Austin. The art program provides a safe and supportive environment that fosters healing and creative expression for our formerly homeless friends. 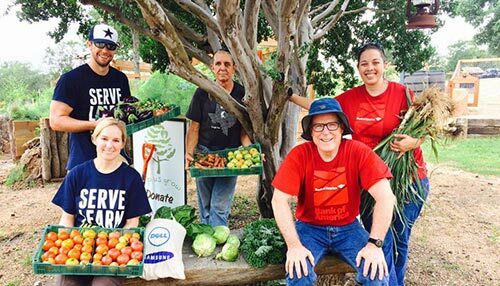 Mobile Loaves & Fishes partners with our Community First! artists to assist with the promotion and sale of their artwork, supporting their efforts to earn a modest living income through the beautiful use of their God-given talents. 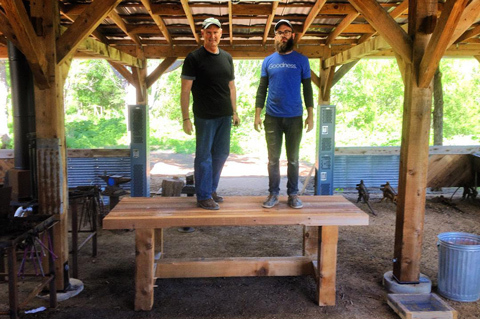 The Community Forge & Woodshop empowers our Community First! friends to engage in the creation of timeless crafts while also earning a dignified income. 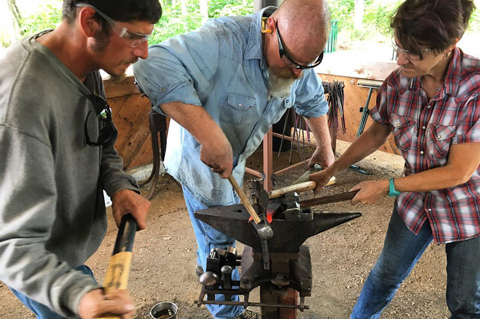 Through blacksmithing, woodworking and a range of other projects, the men and women in this Community Works program become part of a restorative journey toward social contribution, financial stability and a mastery of handcrafting skills. Our craftsmen and artists receive 100% of the profit from the sale of their products, enabling them to become more settled and experience greater stability in Community First! Village. They also encounter a greater sense of purpose, healing and friendships — foundational components of life that every person needs and deserves. Every dollar makes change. The Community Catering & Concessions program provides opportunities for Community First! residents to earn a modest living income through concessions-related events at the Village. The Community Catering & Concessions family includes: the Community Grille, delivering “Honest to Goodness” hamburgers, hot dogs, Frito pies and more at privately-catered and Village-wide events; the Goodness Grille, for preparing and serving brisket and other carnivore-friendly meals at large events; and the Sweet Goodness trailer, where we serve drinks, candy, popcorn, s’mores kits, and other treats for the soul. Volunteers are the backbone of Mobile Loaves & Fishes’ food truck ministry. Not only do they prepare and deliver meals to men and women who are living on the streets, they also provide our homeless friends with the dignity that comes with handshake, a hug or a friendly smile. People of varied interests and abilities can volunteer, whether you want to be hands-on serving food during truck runs, prepare meals behind the scenes, or provide other needed assistance.